Eldrick Tont “Tiger” Woods, the American golfer, is one of the best golfers of all time. He is currently the world’s number one golfer but also the most highly paid sports player in the world. His net worth has been estimated to more then 500 million dollars. It is no wonder that with so much money he owns a yacht. He bought this 154 feet yacht for his wife Elin Nordegren. After their divorce she declined to accept the yacht because of high maintenance costs. Two years ago, there were rumors that Tiger is looking to sell it for $25,000,000. 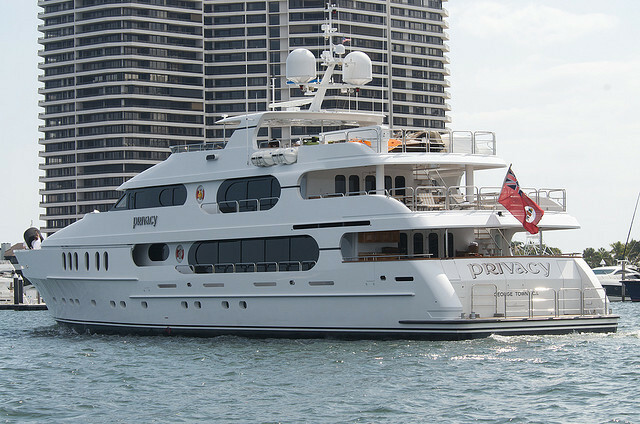 The Yacht, named Privacy, was built by now defunct Christensen Shipyards in Vancouver, Washington, for a reported $20 million. It is reported that the yacht has 6,500 square feet and is capable of guesting 21 persons not counting the crew. It has a gym, theater, master suite, five guest rooms, elevator, sky lounge bar, walk-in refrigerator, built-in wall safes and places for two jet skis.